The esteemed bassist John Shifflett was for roughly thirty years a mainstay in countless San Francisco Bay Area sessions and recordings until his untimely passing in April 2017. Gone, that's true, but far from forgotten. 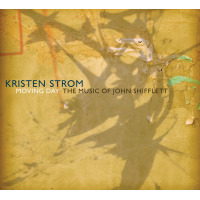 Shifflett, as it turns out, had another largely hidden talent as a composer of bright and accessible jazz tunes, seven of which are performed by a number of his friends and colleagues on Moving Day, a warm-hearted tribute whose nominal leader is saxophone / woodwind specialist Kristen Strom, a long-time member with guitarist Scott Sorkin and drummer Jason Lewis of Shifflett's working quartet. The ensembles, which vary slightly in size and instrumentation on most tracks, step lightly through Shifflett's snappy themes before closing with the concise, hymn-like "Franklin's Men / Northwest Passage," written by Stanley Rogers. Strom, a standout on every wind instrument, plays tenor most of the way, soprano on "Her Garden" and "Down to the Sea in Ships," while no doubt adding background voicings on alto, flute and clarinet elsewhere. She and Sorkin solo most often, with other well-framed statements by bassist Ken Okada ("Moving Day"), trumpeter Jeff Lewis ("Mt. Hamilton"), pianist Dahveed Behroozi and trombonist John Gove ("Quantum Theory"). The music itself parallels what one might expect to hear at a typical nightclub / concert date, shaped to please a sizable audience whose musical tastes are broad and well-grounded. The upbeat title song, underlined by Strom's engaging tenor solo and others by Sorkin and Okada, opens the session on a breezy note, leading to the frisky "Mr. Hamilton" before "Her Garden" slows the pace. Sorkin's guitar and the rhythm section introduce "The Vikings," whose subtle melody is accentuated by Strom's assertive tenor. "Quantum Theory," which follows, is a strapping showcase for the ensemble, Behroozi and Gove; "Down to the Sea in Ships" a lustrous excursion for Strom's emphatic soprano, "Iowa" an earnest salute to Shifflett's home state. Strom describes the enterprise as "a labor of love," one to which every participant clearly brought his (and her) A-game. Even though Shifflett is no longer able to speak for himself, it's credibly fair to assume that he would have been pleased by the result.